The Rev. Robert A. O'Meara dedicated his life to the betterment of peoples everywhere. This memorial scholarship reflects his expressed desire to help others improve the human condition. He wanted to help those adults who wished to enhance their current human services skills, to re-enter the human services, or to change their career to human services. Download and submit the Rev. Robert A. O'Meara Scholarship Application (pdf) by April 14. 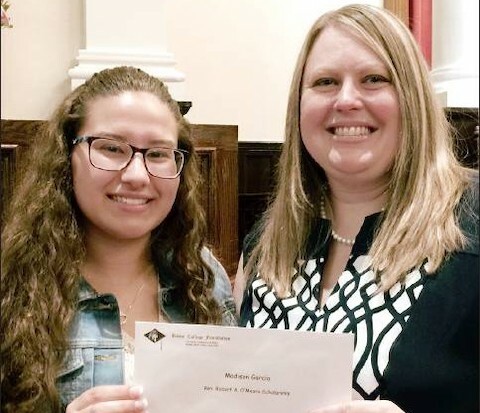 Madison Garcia is recipient of the 2018 scholarship in the amount of $1,500. This memorial scholarship reflects Rev. O'Meara's expressed desire to help others improve the human condition. She is shown accepting the award from Foundation Past President, Brenda McMonagle.